This column is from The MagPi issue 52. You can download a PDF of the full issue for free, or subscribe to receive the print edition in your mailbox or the digital edition on your tablet. All proceeds from the print and digital editions help the Raspberry Pi Foundation achieve its charitable goals. When I was a kid, it felt like it took forever for the holidays to arrive. Now that I’m an adult, the opposite is true: it feels like the holidays come hurtling at us faster and faster every year. As a kid, I was most interested in opening presents and eating all of that amazing holiday food. As an adult, I mostly enjoy the opportunity to pause real life for a few days and spend time with my family – though I do still love eating all that amazing holiday food! Invariably, the conversations with my extended family turn to Raspberry Pi at some point during the holidays. My relatives may have seen something in the news about it, or perhaps they have a friend who is creating their own retro gaming emulator with it, for example. I sometimes show off the Raspberry Pi projects that I’ve been working on and talk about what the Raspberry Pi Foundation is doing in order to put the power of digital making into the hands of people around the globe. All over the world there will be a lot of folks, both young and old, who may be receiving Raspberry Pis as gifts during the holidays. For them, hopefully it’s the start of a very rewarding journey making awesome stuff and learning about the power of computers. The side effect of so many people receiving Raspberry Pis as gifts is that around this time of year we get a lot of people asking, “So I have a Raspberry Pi… now what?” Of course, beyond using it as a typical computer, I encourage anyone with a Raspberry Pi to make something with it. There’s no better way to learn about computing than to create something. There’s no shortage of project inspiration out there. You’ll find projects that you can make in the current edition of The MagPi, as well as all of the back issues online, which are all available as free PDF files. We share the best projects we’ve seen on our blog, and our Resources section contains fantastic how-to projects. You can also explore sites such as Hackster.io, Instructables, Hackaday.io, and Makezine.com for tons of ideas for what you can make with your Raspberry Pi. Many projects include full step-by-step guides as well. Whatever you’re interested in, whether it’s music, gaming, electronics, natural sciences, or aviation, there’s sure to be something made with Raspberry Pi that’ll spark your interest. If you’re looking for something to make to celebrate the holiday season, you’re definitely covered. We’ve seen so many great holiday-related Raspberry Pi projects over the years, such as digital advent calendars, Christmas light displays, tree ornaments, digital menorahs, and new year countdown clocks. And, of course, not only does the current issue of The MagPi contain a few holiday-themed Pi projects, you can even make something festive with the cover and a few LEDs. There’s a lot of stuff out there to make and I encourage you to work together with your family members on a project, even if it doesn’t seem to be their kind of thing. I think people are often surprised at how easy and fun it can be. And if you do make something together, please share some photos with us! Whatever you create and whatever holidays you celebrate, all of us at Raspberry Pi send you our very best wishes of the season and we look forward to another year ahead of learning, making, sharing, and having fun with computers. It’s a good job we have the Coca-Cola adverts here in Blighty, otherwise we wouldn’t have a clue what you meant by your American idiomatic term “Holidays” used to describe Yuletide (a pagan solstice festival, subverted by the Christians to make their celebration). Come on, Dougie. Stop being such a Grinch. (USA-ism intended.) It’s a big old global culture we live in. Nobody here is confused by the term “holidays”. Being curmudgeonly about other people’s perfectly ordinary usage is only going to make the elves of Winterval look upon you with pity. Completely agree – Santa, Christmas tree, presents, etc. It’s CHRISTMAS!! “Holidays” hollydays Schmollydaze – Humbug! Currently Raspberry-Pi-ing my 4-yr old daughter’s kindergarten-made cardboard Christmas tree with loads of LEDs. What I would like for Christmas is a 33-channel PWM board for lots and lots of RGB LEDs. The day the Americuns start Britishifying things just in case a Brit watches/reads something of theirs I’ll gladly eat one of my many hats. You do realise Santa is a US import, right? As are the presents – you won’t see any present-swapping in Dickens. Aside from that goose, which is more of a peace-offering. And the tree’s from Germany, if you’re going to get really pedantic about it. After my retirement in France I started to use the Raspi. First out of curiosity. Then thinking about some useful tasks. So RaspiPlex, as I call my project now, started out to switch my pool pump off during the night, then to give me temperatures on an internal web page. And now having 5 Raspi’s switching pumps, valves, our vacuum tube solar collector (renamed to SolarFarm), boilers, lights, camera’s, a small weather station built from scratch, generating statistics… Recently my agenda is coupled to the boilers to only engage when there are guests or us and switch everything off when nobody is in the house thus saving quite a bit of electricity. On our internal web we can now see the temp of the furnace and central heating to get a warning when to charge new wood. Saving us at least 10% of the wood we normally burn. When something is outside specs I get an email. Thanks to MagPi, maker’s sites, and fora like this there is almost no question left unanswered. It is an amazing time, that you can create whatever come’s to mind without having much knowledge on electronics. Apart from a time machine and FTL traveling, for now though. Your projects sound exciting, maybe you could let us all know details so that we could adapt it to our own situations. I hope soon to start working on some Raspberry pi projects of my own, not having coded in anger since the late 80’s! 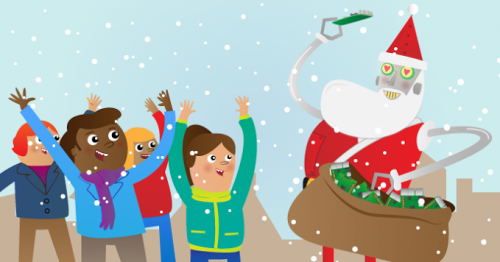 Your Raspberry Pi Christmas Shopping List is here!